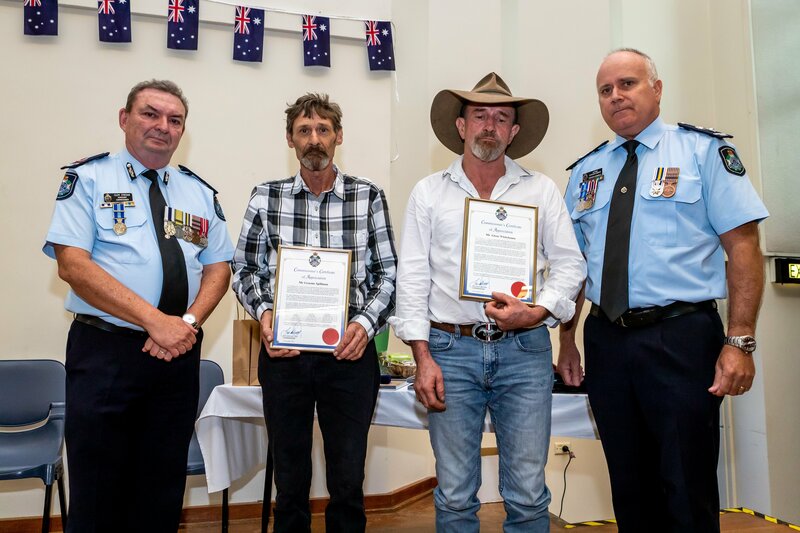 Two Gympie Region men who risked their life to save a boy from drowning and attempted to save another were recognised at the Australia Day Ceremony held at the Gympie Civic Centre on January 26, 2019. Graeme Spillman and Adam Whitehouse were each awarded a Commissioners Certificate of Appreciation for their valiant efforts at Tin Can Bay on February 12, 2017. Mr Whitehouse was walking along the beach when he observed two boys in trouble at Norman Point. Without hesitating, he entered the water and swam out to provide assistance to the boys who were panicking. Mr Whitehouse fought the strong tidal current and exhaustion to keep the boys afloat. Mr Spillman was working on a boat anchored in the bay when he observed Mr Whitehouse struggling with the boys. He drove a boat towards them to provide assistance. Mr Spillman pulled both boys from the water then went to assist Mr Whitehouse, however he let go of the boat as he was too exhausted to hold on. Mr Spillman reached down as Mr Whitehouse started to go under water and pulled him to the surface. In presenting the awards, Assistant Commissioner O’Regan and Acting Superintendent Donnelly commended both men for their quick thinking and decisive actions which put the welfare of others above their own. The actions of both men have also been referred to the Australian Bravery Decorations Council and the Royal Humane Society for consideration.